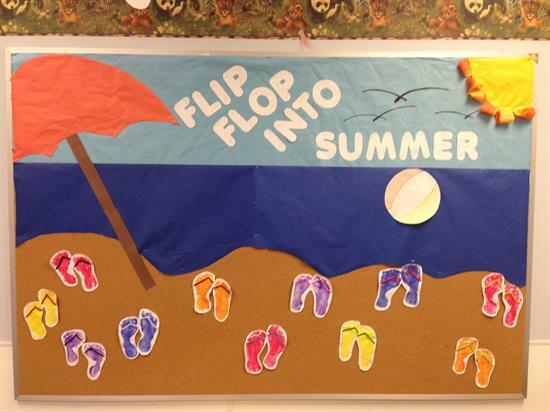 Spruce up your summer bulletin board with this super cute flip flop idea that was featured in a classroom at McKinley Early Childhood Center. What a fun way to kick off summer! And better yet - there is a craft to help get your kiddos involved in decorating! Make a pair of footprints for each child using assorted color paint. Then, once the paint has dried, cut out the footprints and attach a piece of yarn to make the print look like a flip flop (attach each end of yarn to one side of the foot and then bring the middle toward the top and attach). Easy peasy! Background: Light blue bulletin board paper (sky); Dark blue (water); Tan (sand). You could also just leave the bottom portion of the board exposed and allow the cork to represent the sand (as shown above). Title: "Flip Flop into Summer"
Border: A border is not necessary, but you could always add a cute summer-themed trimmer.